The crew of the Inshore Lifeboat (ILB) were called by the UK Coastguard at 8.33am on Friday 13 October reporting that a yacht had run aground on Hoo Island in the River Medway with its sails still set. The crew located the craft at 9.09am and found the yacht hard aground on the island. The single male occupant of the craft reported that he lived onboard the boat and was quite happy to await the next high tide to re-float him and then make his way back to his mooring at Strood. The ILB was released at 9.26am and was back on station at 9.50am. Weather conditions at the time of the incident were fair with the wind SW force 5. The Sheerness Inshore Lifeboat carrying out a rescue at Lower Halstow YC will feature in a TV series on BBC2 starting on Wednesday 16 August at 8pm. 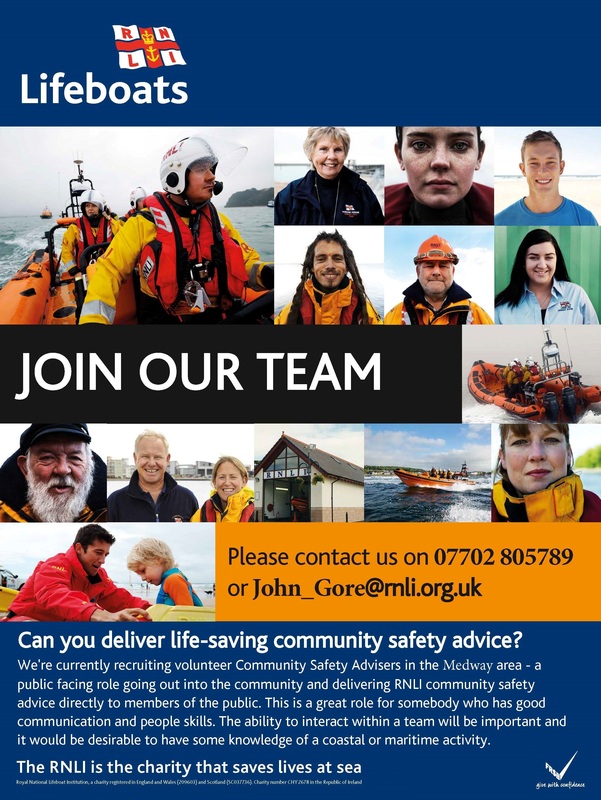 Saving Lives At Sea tells the story of the volunteer lifeboat crews and lifeguards of the RNLI who rescue thousands of people and save hundreds of lives around our coastline and on the River Thames every year. Sheppey’s new inshore lifeboat has been named Buster after a 99-year-old man who loved “messing about in boats”. The D-class rigid inflatable, with a top speed of 25 knots, was delivered to Sheerness on August 11 and has already been on 34 call-outs. 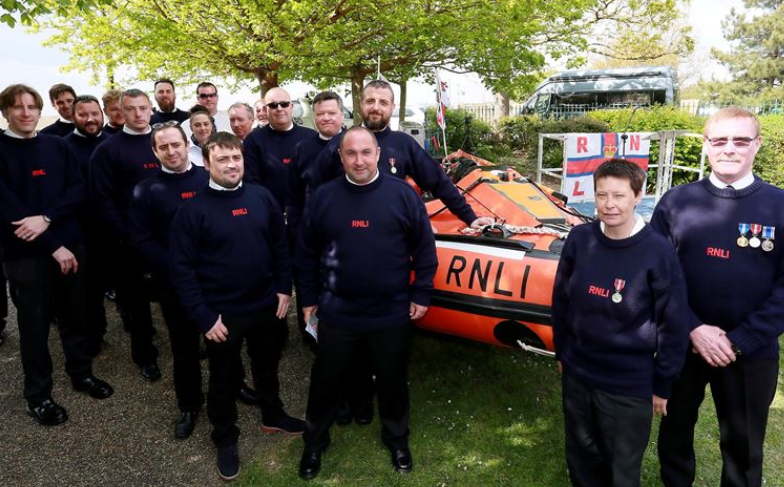 On Sunday, more than 100 volunteer crew, supporters and friends of the Royal National Lifeboat Institute gathered in Queenborough’s Elephant Park to give the 5m-long rescue boat its name. Brian Mills, Buster’s son who sprayed champagne over the bows of the £52,000 boat, said: “It was a very proud moment for me to name the boat after my late father. On Sunday afternoon, 9 April, a man fell about 10 feet onto another crew member from the mast of a yacht moored in Gillingham Reach. While the injured man was given oxygen, the Sheerness Inshore Lifeboat fetched a paramedic from an ambulance waiting at Gillingham Marina and then transferred him ashore. We understand the man suffered broken ribs. 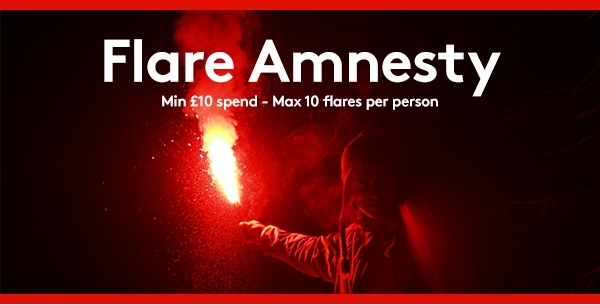 There were two jet skis and eight personal watercraft (PWCs) in the area at the time and some of these were creating a lot of wash which was a nuisance and hazard to youngsters being trained in dinghy sailing at the Strand. The speed limit here is 6 knots (approx 7mph). 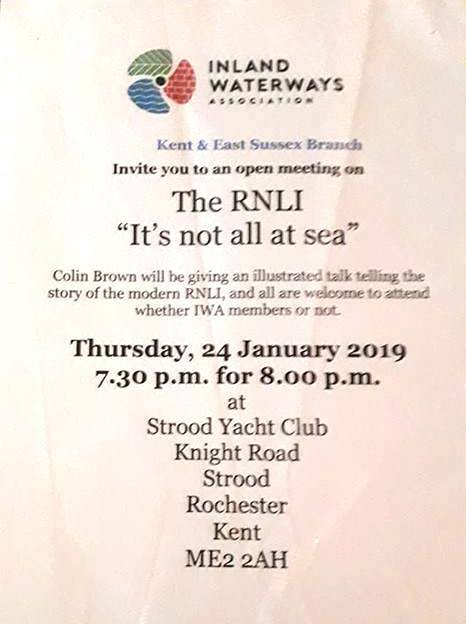 Trevor Peen, a director of Medway Watersports, radioed Medway VTS to report this activity but could not get a response. When he called by phone he was told there was nothing they could do.